SWAPS stands for Special Whatchamacallits Affectionately Pinned Somewhere. They are part of a Girl Scout tradition to trade something with one another to help you remember an event or new friends you meet. Our troop LOVES them and they are really a great way to get your girls to introduce themselves to other girls at Council events and Service Unit events and where ever they may be gathering for activities. I use them a lot for filler activities during meetings. This year, I think we are going to make a holder and then make a different SWAP at each meeting, because the girls are continually asking when we get to make another SWAP. So, we'll make two or three each. One to keep and the others we will stockpile to trade with a younger troop or distribute through the Children's Hospital as a little pick me up. There are a million and one ideas for making SWAPS. They can be simply a few beads on a safety pin or an elaborate display of your craftiness. I have a Pinterest Board devoted to just SWAPS with a LOT of cool ideas. I wanted my SWAP to be something "song" related and Twilight Camp* related. So, I decided to go slightly simple, yet somewhat tricky to pull off. I'll give you the history, because I know you'll want to know how I arrived at this. I was cleaning out the old desk and found a huge package of CD Stomper CD labels. I had already planned to print up some CD labels that I'll use for Back To School night activity (be watching for that post, too). I saw the smaller circles and thought "Wow.. I don't want to waste those! What can I make?" Then, it hit me! CD circles only the smaller ones... I'll make a record (you know those old school vinyl discs that spun on a player and played music). But, what do I put on the record? Hmmmm.... All of the songs that will be in their Song Booklet for camp on one side and the event name and theme on the other. OH YEAH!!! A SWAP was born. Now, I know a record doesn't have a label on each side, but I wanted the event name, etc on it... so we'll just deal with it. Here is the finished SWAP. The instructions are below. Clean out a desk and find CD Stomper labels OR in Word use the Word Art feature to enter your text and turn it in to a circle. Then print. If you use sticker sheet paper, you won't have to glue later. Buy or cut out chipboard circles slightly larger than your Word Art. I used my Cricut with the deep cut blade, but you could probably buy them, too. And.. you could probably use foam, too. Paint base circles black or cut out cardstock circles the same size as the base circles. Cut out twice the amount, because you have to glue to both sides. Peel and stick labels to the bases OR cut out your circles and glue them on, if you just printed on plain paper. Make a hole and insert your safety pin. I used a Crop-A-Dile, but you could use a heavy duty 1/8" hole punch, too. I didn't have all coil-less safety pins, but with the small hole they hang just fine. But, coil-less would be better. * Twilight Camp is one of our Service Unit events. It's four days from 3-8PM. The girls are divided into units. 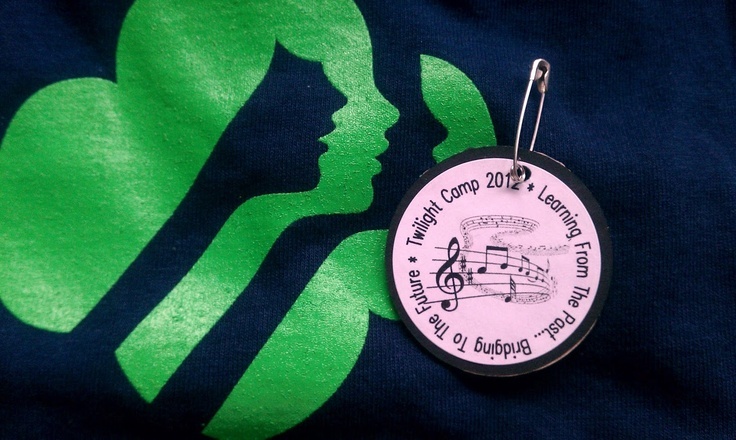 Each unit completes activities to earn a badge for their level in Girl Scouts, plus they get a t-shirt, fun patch for camp, and have a TON of fun. It's a great event and I'm so happy to be part of it. First Aid was a badge the girls were very excited by and they had a million questions. We didn't discount any of their questions and tried to answer them all on their age level, while giving them information about further education for later in life. I think I prefaced a lot of answers with, "At your age" or "We don't expect you to be able to treat injuries or be the one in charge, but just in case you are ever in a situation where an adult needs your help we want you to have some basic knowledge so you won't be as frightened and can help. This may just be knowing when to go get help and even as an adult there are many times that is the correct response, because medical professionals are trained how to treat the injury. We just need to know what to do before they arrive." I spoke with the school nurse and had her come talk to the girls. I felt this would be a good choice, because 1. She was a woman and I like using female presenters when I can. 2. They knew her and would be comfortable asking questions. 3. They would be able to see her in the hallway and say "hi" and ask follow up questions. 4. It was convenient! My co leader put together different scenarios for the girls to talk through. Our first step was to go over what information you needed to know when calling 911 and how to remain on the line until they tell you to hang up. Then, we went over the different scenarios and quizzed them on what to say and do. Examples: 1. Slightly burned while baking cookies - Call or not? How bad is the burn? How do you treat a minor burn?2. Scraped knee while bike riding - How bad is it? How close are you to home? How do you treat scrapes and cuts?3. An adult is having chest pain - Another adult home? Has it happened before? The age of the adult? Are they conscious? What does conscious mean? Basic signs of a stroke or heart attack.4. Fell while hiking and hurt leg or arm - Do you think it's broken? How to tell? Where to go for help? How to make an arm sling and basic splint. In preparation of this, we sat the girls down and had them ask any and all questions they could think about for the nurse. They ranged from injuries, to lightning strikes, to why she chose nursing and what she likes about it. I emailed those to her in advance, so she knew where their minds were and the types of questions to expect. Then, the day of the interview, she was FANTASTIC and patient. She listened to each of the girls questions and went through the list. She kept the information on their level and did a great job of making them feel comfortable to ask anything. I gathered band-aids, gauze, tape, ointment, and all kinds of basic first aid kit supplies. We talked about how the kit was designed to treat them. They are not old enough to treat someone else's injury, unless it was a minor scrape. We talked about the importance of being careful not to get someone else's blood on your skin and to always tell an adult if they have used anything out of their kit and show them the injury. I got pencil pouches for these and put everything in a ziploc baggie. They were designed to be in their backpack, so if they got hurt going home or when out they could use it if needed. They were very excited about this and I think they just felt empowered and trusted to know we felt they were capable of taking care of minor stuff. We still stressed the importance of telling an adult, just in case it needed more attention. Brownie First Aid #4: How to treat minor injuries (nurse) The nurse went over how to use everything in the kit. We demonstrated the proper way to put on a bandage, how to wrap gauze and tie it off, the reason why you would apply pressure to a cut, when and how to use ointment, etc. For this segment, we talked about poison ivy and basic injuries. The girls wanted to know what to do if struck by lightning or if a tree fell on you. She did answer those questions calmly and on their level, while stressing that those scenarios are less likely to happen than maybe a fall where you scrape your knee or twist your ankle. Will know or even care. Will look and see and know. We split our snacks badge up over several meetings, because I didn't want to feed them enough food for a meal in one meeting right before they go home at dinner time. The recipes we used were not in the Girl Scout book, but they met the criteria. I wanted things the girls could easily do and have multiple steps, so each girl had a turn in adding something, stirring something, etc. 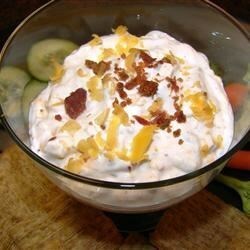 The girls LOVED this dip, as did my co-leader and I. It was easy to mix up. I purchased bacon pieces from the salad dressings aisle, so we didn't have to cook it and crumble it. It was served with Frito scoops and devoured! Mix all ingredients together well. Serve with Fritos scoops. Crush cookies in a bag with a rolling pin. Combine cream cheese, sugars, and vanilla in a bowl until smooth. Add crushed cookies and walnuts. Stir until blended. Refrigerate if not serving immediately.Great for dipping apples! There are a million ways to make a smoothie. This is what we went went. I had strawberries, peaches, blueberries, and bananas for the girls to choose from. In order to help with cooperation and collaboration, I had them decide on what fruits to add to the first batch and the second batch. We did taste tests together. Place fruit, yogurt and sugar into blender. Fill with ice about ¾ way. Add a little milk (1/4 c to start) and blend. Add more milk as needed. Serve in glassed with a straw. This recipe was in a Girl Scout cookbook. I used Chex, because they were in the pantry. I also dried (and failed) to add mini chocolate chips over top. The mixture was too warm and the chocolate just melted. The girls still loved it. I did make these in advance of the meeting. We discussed the different ingredients and went through the recipe. I first had the girls guess and tell me what all they tasted in there, even down to the butter and marshmallows which you couldn't see. Spray a 2 in. deep 9x9 baking pan with cooking spray. In microwave, melt butter - 45-60 seconds. Stir in peanut butter and marshmallows. Microwave on high for 1 to 1 ½ minutes. Stir until smooth. Add dry milk, cinnamon, raisins, and cereal. Stir until evenly coated. With buttered hands pat mixture into pan. Cool thoroughly and then cut into bars. Makes 16 bars. Our troop worked on the Brownie level Painting badge and completed all five activities in one meeting. They are a very artistic and creative group. The girls were extremely excited about the painting activities. I really didn't think we'd get it all done in 1 1/2 hours, but they did. 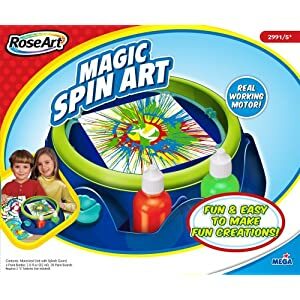 My step daughter had a Spin Art machine and we thought it was so cool. One of the Painting badge requirements is to paint without brushes, so we did Spin Art. I actually cut glossy white card stock in the sizes we needed, instead of using up all the papers that came with the machine. We also used just regular washable kid paint, rather than the paint that came with it. They turned out great. The girls were given a sheet of 6x9" watercolor paper and asked to paint something they have seen in the real world. They could paint a landscape, a portrait, or an object. It just had to be real and using the real colors, so no purple cows. Once again, the girls were given a sheet of 6x9" watercolor paper and paint supplies. 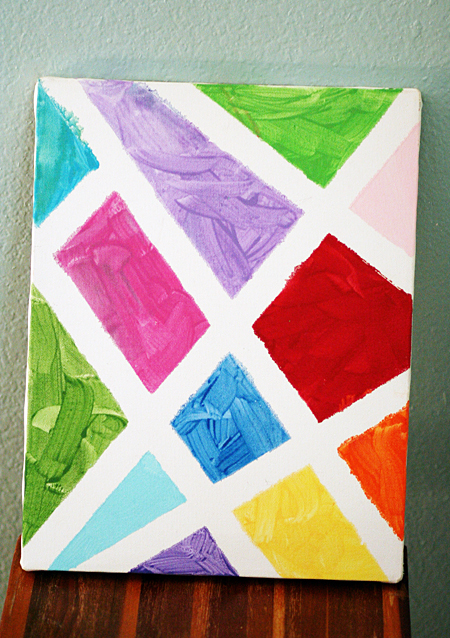 This time, they had to choose a mood and paint an abstract to show that mood. I stressed that most of the time you relate black to sad, yellow to happy, blue to calm, but they were free to interpret colors however they chose. Art is interpretive and I wanted to make sure they were given the freedom to create. This was by far the least messy. My wonderful husband went to the library and checked out a few fine art books. We flipped through the books together and discussed the different types of art. It was interesting to hear the girls point out what they liked and didn't like. By the end of the third book, they each could say what style they really liked and hopefully had a appreciation for the different styles, too. You have to complete five activities to earn the Painting badge. Since paint takes a little while to dry, we pushed snack time to the end of the meeting. I also structured the painting items in the order of which ones I felt would take the longest to dry to least amount of time. For the first and second project listed, I actually gave the directions for both projects at the beginning. My co-leader stayed at the canvas table station and I had one of the girls at a time come to the spin art station. This worked great for us. We also had an area set up for drying that was separate from where they were painting. We didn't want to chance any spills or splatters ruining a masterpiece. Our girls were familiar with the terms abstract, landscape, still life, etc. because they had been studying it in Art class at school. If your girls aren't familiar with the terms, you may want to look through books first with them to show them the styles before creating the paintings. I started several boards on Pinterest a while back with the intent of putting Girl Scout ideas on one. I soon discovered that would not suffice. So, I divided and added three more. After setting up this blog and thinking about my poor visitors wading through my "Girl Scouts" board that had everything from recycling to service projects to crafts to science... I did a little reordering and repinning and rethinking. I'm working on it. It's a work in progress. But, I think I have a good starting point for all of us now. On the right side in the navigation you will see links tot he various boards. You are more than welcome to look and grab anything you like. If you aren't on Pinterest, but would like to be... send me a note and I'll send you an invite. Now, I have 10 boards... divided somewhat logically. I do hope to add a couple more... Especially a board that is badge activity specific. I'm also planning on going back and giving a run down of what we have done for each badge we earned at Brownie level and then I'll do the same for the Junior level journey and badges we go after. Do you take the Summer off? This is a question that presents itself each Summer. Do we have meetings? Do we plan events? Do we just wait until the school year begins again? For our troop, we have taken the Summer off from troop meetings. This is because their leader needs a break. We do plan one troop trip and I promote the Summer resident camps and day camps in our area, along with any other events I may happen to hear about. I also volunteer to help at the day camp and encourage my girls to take advantage of it. Summer gets crazy with softball, vacations, swimming lessons, and everything else. I know of troops that do meet in the Summer months and they wouldn't trade it for anything. I use the Summer to plan the next year. Okay, I'll be a little more forthcoming here. I use the first part of the Summer to finalize plans for the troop trip. Then, the rest of June and July are spent staring out windows and thinking; not really planning. August, I pick up whatever we are going to start the year with and start formulating a plan. I give the girls a couple weeks back in school before we do a troop meeting, because that way Summer jitters have subsided a tad. We begin regular meetings the first week of September each year and this works for us. I say this with a reminder... do what works for YOU. You are the leader and you have to know what you can and can't handle. 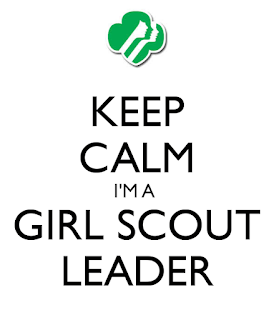 A lot of responsibility to learn and develop a plan falls on the Girl Scout Leader. While the meetings are to be "girl-led", there is only so much you can expect from the younger girls (Daisies and Brownies... and even Juniors). I think it's very important to make sure the girls have a say in the type of kapers (kaper is a fancy word for chore or responsibility, such as cleaning up or leading songs or passing out snacks), the basic flow of a meeting, what they want and don't want to do, and so on. The problem is... they have never been a Girl Scout at the level they are before either. You are both new to this. Someone needs to find some ideas to at least give choices.... and that falls on the Girl Scout Leader. This blog came about because my husband and I were talking about new leaders and how hard it was to figure out what to do and get things together and know what we could and couldn't accomplish. He simply said "How hard would it be for you to put all of the information you have together and share it with new leaders?" My reply "You mean like a brain dump of two years worth of data?" He says "Yeah... that." My snarky comment got me no where I see... but then, as he knew I would, I started thinking and formulating a plan. You know... I could do that. I could help new leaders out. I could at least share my Meeting Outlines, my Pinterest Boards, my Songbooks, my list of websites that have helped me, and anything else I could throw in there. I could also talk to other leaders I know now and see if they would like to contribute to the blog (this is a work in progress). Why not? So... here we are.. you and me... one step at a time we will get through this.... and it will be amazing! Tries to listen to 10 little girls' conversations all at the same time. Wakes up in the middle of the night worrying about the girls who weren't at the last meeting. Calls 5 mothers about the one galosh that was left at the meeting place. Finds that cookies, Kool-Aid, and kind words will help solve most any girl's problems. Attends hours of training and how-to sessions only to discover that the meaning of Girl Scouts is at the bottom of her own heart. Remembers to bring insect repellant. Says "Yes, I'll do it!" when it should be "No, no, a thousand times no!" Gets a warning ticket from the State Patrol with a station wagon full of very quiet girls. Is a friend to the friendless and a foe only to big brothers who throw rocks. Breathes deeply of the wonderful silence after they all go home but looks forward to the meeting next week. Sings "Kookaburra" in the shower. Knows that the secret of eternal youth is not at the cosmetic counter but in meeting with it every week. Gives and gives and gives and gets: sticky kisses, shy hugs, sly winks, and not much later, wedding invitations and baby announcements. 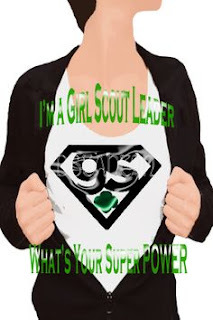 A GIRL SCOUT LEADER IS SOMEONE WHO IS VERY SPECIAL! Me? A Girl Scout Leader? Now what? 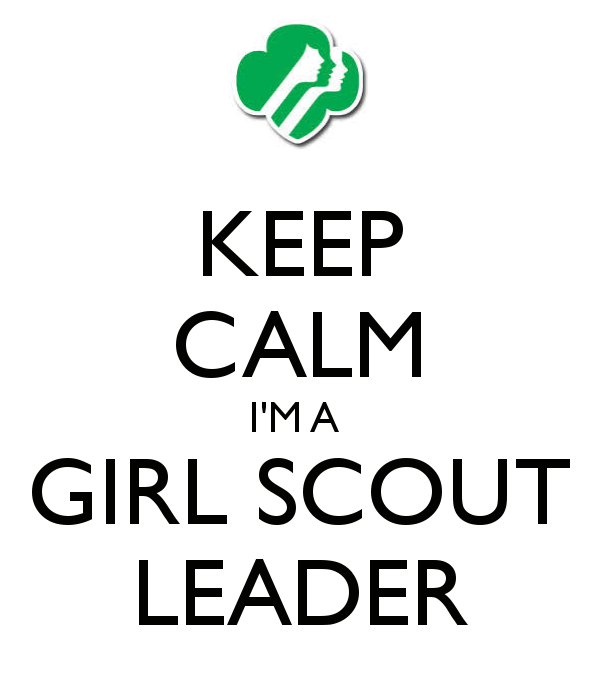 I was not a Girl Scout as a child, in fact I shied away from joining a troop. I never dreamed in a million years I would be a Girl Scout Leader. The title never entered the picture of things I thought I would do. But then one fateful day that many of us have faced, presented itself to me. It was the day I heard my step daughter ask when her troop was going to meet for the first time of the school year. It was her first year of Brownies. She was in 2nd grade. She had joined a troop with some classmates in 1st grade. So, I contacted the leader and she told me she was trying to find someone to take the troop. She wasn't able to continue and the lady that was going to take over the troop wasn't following through and to be honest, was no where to be found. So, after talking it over with all parties involved (which included my husband, his ex-wife, my mother-in-law, and of course my step-daughter) and after the former leader suggested I would be great at it (something we have all heard, whether it is true or not! Ha!)... I gave it more thought. I talked to my step daughter to see how she would feel about it. If she felt it was a good decision. She squealed with delight and said "Yes, yes! PLEASE!" My fate was sealed with that conversation. How could I not step up to the challenge for the most precious person I have ever met in my life? Thus began the journey to be a Girl Scout Leader. I had no idea I would be entering a world where camping was exciting and teaching leadership was a key responsibility. I'm not a big outdoors person and I had never been tent camping overnight in my life. Wasn't Girl Scouts all about selling cookies and crafts? Making the decision was the easy part. Then came the hard part... what do I do with the girls? What am I supposed to do at meetings? What are all these terms I hear and have never heard before... flag ceremony? friendship circles? bridging? badges? fun patches? journey books? kapers? council? service unit? service team? I was quickly overwhelmed. I didn't know any other leaders. I had never been to a Girl Scout troop meeting. I was faced with seven little girls who were counting on me to know what I was supposed to be doing... and I did what any good leader would do... I bluffed my way through it and hoped for the best! Thankfully, Girl Scouts is "girl-led". I had a great resource right at my house... my step daughter. I would ask her about this and that and what she thought would be fun. I searched the internet and found plans for first year Brownies. I emailed my representative at Council until I'm sure she was sick of seeing my name. I hoped to find a location we could meet and I worked with my employer to flex my schedule to make that happen. It did all come together. In fact, looking back... it really did all fall in to place quite nicely. While we started late in the year that first year... our first meeting was in November!... it did all come together. The girls were excited and I had books and a plan. If you can get past the initial fear of "WHAT did I get myself into? ", it will truly develop into "WHY did I wait so long to volunteer?". You don't have to be a Mom or Step-mom or Grandma. You don't have to have kids. You have to have a willing heart and mind to step up and make a commitment to volunteer (patience is a nice asset to have, too). I won't lie to you... it IS a commitment. It IS a lot of work. But, the rewards outweigh all else. You WILL change the lives of the girls in your troop and you WILL change the world by your involvement.